, in Roman religion, god of beginnings. He was one of the principal Roman gods, the custodian of the universe. The first hour of the day, the first day of the month, the first month of the year (which bears his name) were sacred to him. ..... Click the link for more information. ]: carnelian or peridot; September [Lat.,= seven; formerly the 7th month]: chrysolite or sapphire; October [eight]: beryl, tourmaline or opal; November [nine]: topaz; December [ten]: turquoise or zircon. The period of the Moon's revolution around the Earth with reference to some specified point in the sky (see table). The differences in the monthly periods result from the complicated motion of the moon. (2) the sidereal month, during which the moon performs a complete revolution about the earth and returns to its original position relative to the stars; (3) the tropical month, which is the period during which the moon returns to a given longitude; (4) the anomalistic month, which is the interval of time between successive passages of the moon through the perigee; and (5) the nodical month, which is the period of time between successive passages of the moon through the same node of its orbit (this concept is important for the theory of eclipses). In the Gregorian calendar, the year is divided into 12 months, each month containing from 28 to 31 days; this calendar does not agree with the lunar phases. Figure 1. 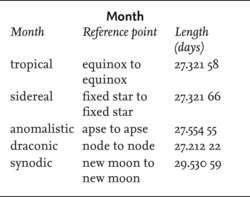 Difference between synodic and sidereal months. (1) and (3) are the relative posiositions of the sun, earth, and moon at which a full moonon occurs (a time interval of oneone synodic month); (2) is the position of the moon after a complete revolution about the earth (a time interval of one siderealreal month). 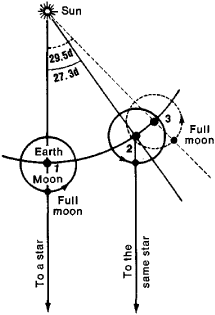 The period of the revolution of the moon around the earth (sidereal month). The period of the phases of the moon (synodic month). The month of the calendar (calendar month). DBK (41) The month is divided into three periods, the waxing, the mid-month, and the waning, which answer to the phases of the moon. 750-759) Do not let a boy of twelve years sit on things which may not be moved (39), for that is bad, and makes a man unmanly; nor yet a child of twelve months, for that has the same effect. What can I recall of her during the past six months, before I close my journal for the night? In other words, it is always Laura Fairlie who has been writing to me for the last six months, and never Lady Glyde. From seven months onward until now, A has still been a usurper, and in my finger record he bears B's name. For three months I kept this pace, only breaking it on several occasions. And while I forgot that I had plunged into the books nineteen hours a day for three solid months, Charley Le Grant shifted my outfit into a big Columbia River salmon boat. The first month, members receive a cookbook and a basket filled with ingredients for a complete Italian meal.